Department of Dental Pharmacology, Matsumoto Dental University, Shiojiri, Japan. Background: Among anti-hypertension drugs, calcium (Ca2+) antagonists cause gingival overgrowth as a side effect. We previously discovered that this side effect was due to elevation of the calcium concentration in the cytosol ([Ca2+]i). 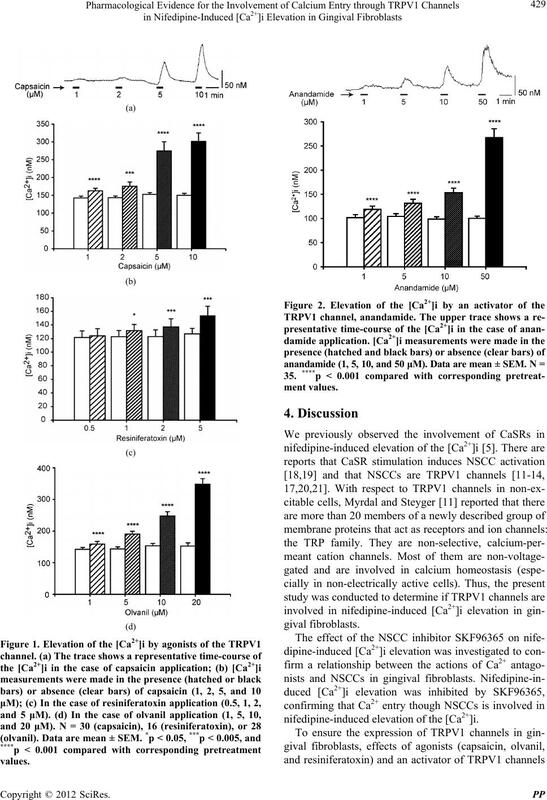 nifedipine-activated NSCCs are TRPV1 channels. Methods: Normal human gingival fibroblast Gin-1 cells were used. The [Ca2+]i was measured using a video-imaging analysis system with the Ca2+-sensitive fluorescent dye fura-2/AM. NSCCs  and Ca2+ release from Ca2+ stores . ence [Grant-in-Aid for Scientific Research (C) 22592321]. perm disc (Greiner Bio-One GmbH, Göttingen, Germany). nm). The emission wavelength for analyses was 500 nm. at appropriate concentrations were added to the perfusate. nifedipine-induced elevation of the [Ca2+]i (Figure 3). nifedipine-induced elevation of the [Ca2+]i.
iniferatoxin), 24 (ruthenium red), or 29 (SB366791). ****p < 0.001 compared with corresponding pretreatment values. 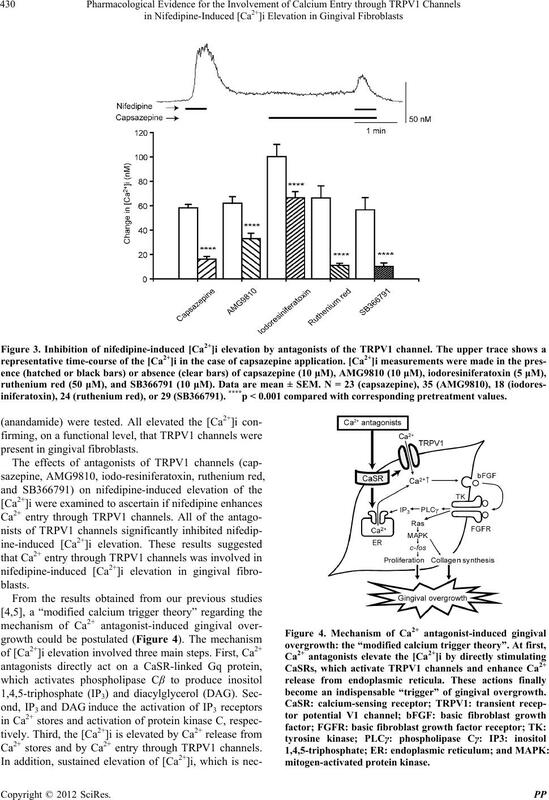 Ca2+ stores and by Ca2+ entry through TRPV1 channels. become an indispensable “trigger” of gingival overgrowth. factor and activation of tyrosine kinase. and Pharmaceutical Bulletin, Vol. 28, No. 10, 2005, pp. 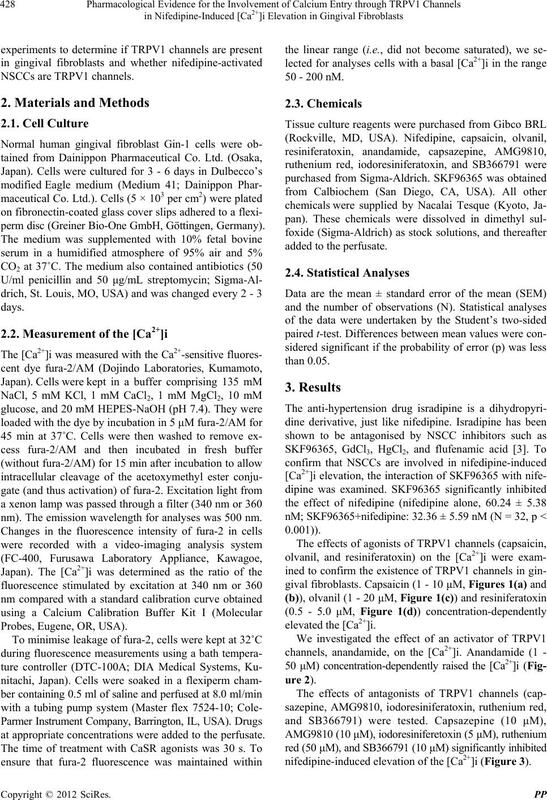 val Overgrowth,” European Journal of Pharmacology, Vol. 583, No. 2, 2008, pp. 37-39.
cology and Pharmacotherapeutics, Vol. 2, No. 1, 2011, pp. Thyroid Parafollicular Cells,” Journal of Physiology, Vol. 502, No. 1, 1997, pp. 31-44. C. Remy, P. Kirchihoff, P. Hafner, S. M. Busque, M. K.
ology and Biochemistry, Vol. 19, No. 11, 2007, pp. 33-42. M. Bandell, G. M. Story, S. W. Hwang, V. Viswanath, S.
 M. Freichel, R. Vennekens, J. Olausson, M. Hoffmann, C.
Müller, S. Stolz, J. Scheunemann, P. Weissgerber and V.
mical and Biophysical Research Communications, Vol. 32, No. 4, 2004, pp. 1352-1358. 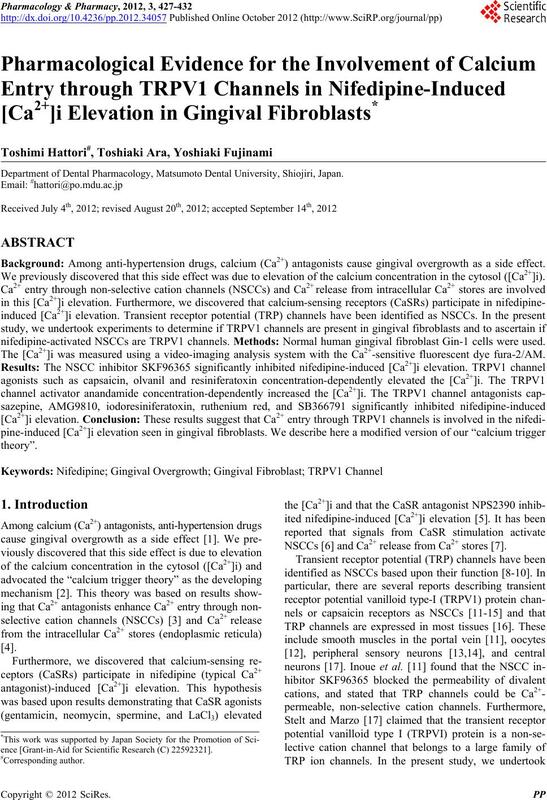 R. Inoue, T. Okada, H. Onoue, Y Hara, S. Shimizu, S.
Neuroscience, Vol. 25, No. 21, 2005, pp. 5109-5116. N. R. Gavva, R. Tamir, Y. Qu, L. Kliosky, T. J. Zhang, D.
Immke, J. Wang, D. Zhu, T. W. Vanderah, F. Porreca, E.
M. Doherty, M. H. Norman, K. D. Wild, A. W. Bannon, J.
macology and Experimental Therapeutics, Vol. 313, No. Hearing Research, Vol. 204, No. 1-2, 2005, pp. 170-182. 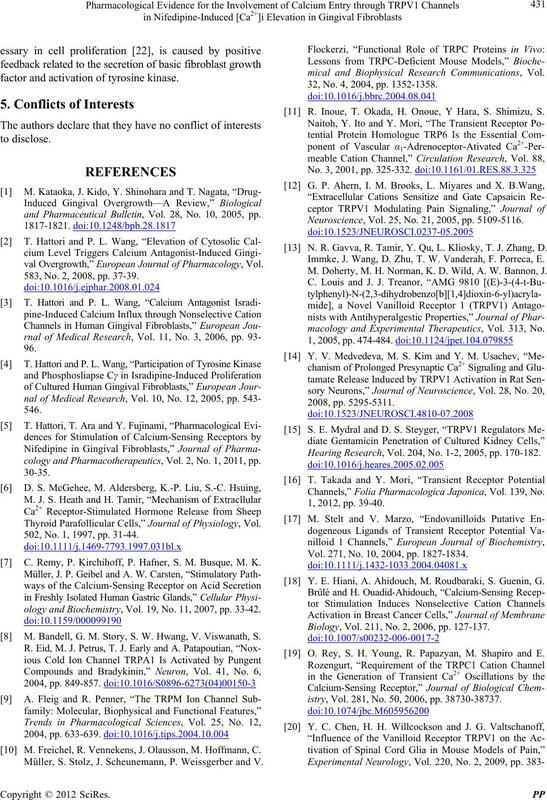 Channels,” Folia Pharmacologica Japonica, Vol. 139, No. Vol. 271, No. 10, 2004, pp. 1827-1834. Y. E. Hiani, A. Ahidouch, M. Roudbaraki, S. Guenin, G.
Biology, Vol. 211, No. 2, 2006, pp. 127-137. 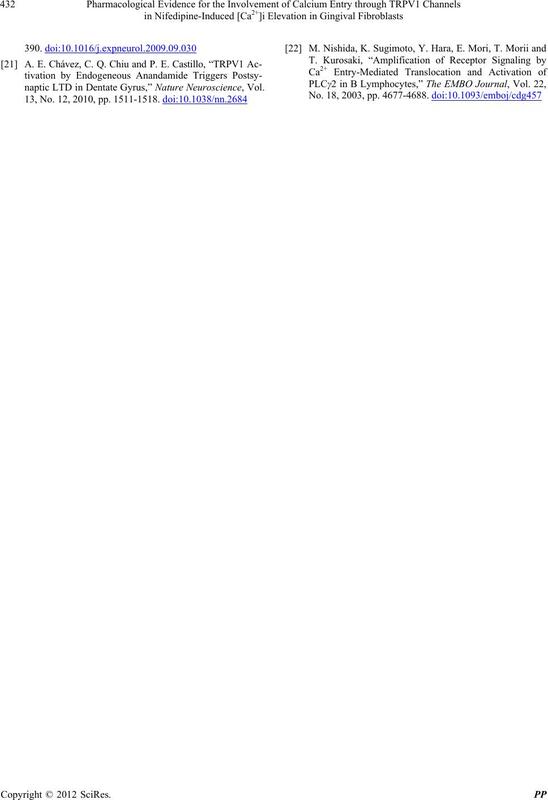 O. Rey, S. H. Young, R. Papazyan, M. Shapiro and E.
istry, Vol. 281, No. 50, 2006, pp. 38730-38737.
naptic LTD in Dentate Gyrus,” Nature Neuroscience, Vol.